Dr. Brian Lyngaas designs and places high-quality, long-lasting dental crowns and bridges at our Livonia, MI, practice to protect damaged or decayed teeth. These restorations can also be used to replace one or more missing teeth. Although many modern crowns and bridges are made the same day with special software and milling technology, Dr. Lyngaas believes in using proven, trusted techniques to deliver higher quality results. Specifically, traditionally crafted restorations look more natural and will never affect your bite. He also works with highly trained dental technicians at a state-of-the-art lab to fabricate your customized crown or bridge. Your restoration will be made from either porcelain or zirconia, and designed to blend beautifully with your smile. Made from durable and lifelike materials, crowns and bridges are designed to restore the aesthetics and dental function of your smile. Dental crowns and bridges are affixed to natural teeth or dental implants, small posts which are placed in the jaw, to provide durable, long-lasting results. Made from durable and lifelike materials, these prostheses are designed to restore the aesthetics and dental function of your smile. Dr. Lyngaas generally recommends dental crowns for patients with a significantly decayed, fractured, or discolored tooth that cannot be repaired with other cosmetic or restorative treatments. The restorations can also be used to cap and protect a tooth after root canal therapy. A dental bridge is beneficial for patients missing one or more adjacent teeth, and literally bridges the resulting gap. Your restoration will be fabricated with two dental crowns on either side of one or more pontics (false teeth), and attached to your nearby teeth with dental cement. An implant-supported bridge can provide improved stability and also avoid the need to alter healthy teeth. During the initial consultation, Dr. Lyngaas will take digital x-rays to review the extent of damage and present the options available to restore your smile. In customizing your treatment plan, he will take into consideration your unique needs, as well as the time commitment and costs involved. Before a restoration can be created, he will need to address any damage or infection with periodontal treatment, root canal therapy, or another procedure. Dr. Lyngaas believes in using proven, trusted techniques to deliver higher quality results. Specifically, traditionally crafted restorations look more natural and will never affect your bite. For implant-supported devices, you will first need to undergo a brief surgery to place one or more titanium posts in your jaw. This will require an additional four to six months of recovery in order to create a firm foundation for your permanent restoration. For traditional crowns and bridges, Dr. Lyngaas will reshape the chewing surface and sides of the tooth to prepare it for the crown. He will then take impressions for a lab technician to use for customizing your natural-looking restoration. You will receive a temporary crown or bridge at this time. 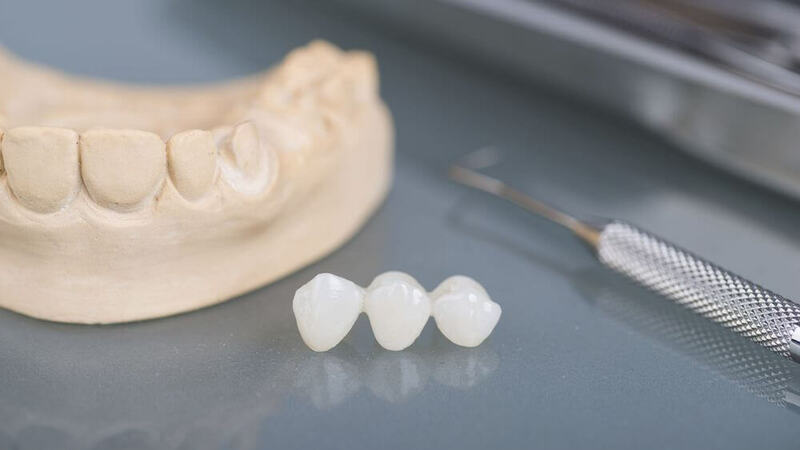 In about one to two weeks, once your restoration is completed, the doctor will ensure it fits properly, then attach the crown or bridge with dental cement. If you have a severely damaged or missing tooth, you may be an excellent candidate for a dental crown or bridge. Contact our office today by calling (248) 473-005 or use our online form to schedule your initial consultation with Dr. Lyngaas.